Few coins catch the mind of the American numismatist as much as the 1913 Liberty Nickel, one of the rarest of all American coins, with only five examples known to exist. Technically, this issue might not be a true coin intended for circulation, but rather a more of a fantasy piece struck under mysterious circumstances. Nonetheless, the coin has long fascinated collectors and gained even greater fame after it was the focus of a popular American television show. The known examples of this numismatic rarity carry impressive pedigrees and generate substantial interest on the infrequent occasions when they are offered for public sale. First of all, the 1913 Liberty Nickels never should have existed in the first place. The series of Liberty Nickels was minted for circulation from 1883 until 1912, and in 1913 the new Buffalo Nickel was introduced and soon found in the pockets of Americans nationwide. The scarcely known facts indicate that by the end of 1912 it was already determined that a new design would be introduced on the nickel denomination and production of the previous design was halted at all mint facilities in operation at the time, despite new 1913 dated dies already having been shipped to the San Francisco Mint. Exactly how 1913 nickels came to be produced with the older design is shrouded in mystery. For many rarities we know the month in which they were produced, sometimes even an exact date, but none of that all applies to the present case. In fact, it can only be speculated as to whether the coins were actually struck in 1913, or during the last few months or days of 1912. The existence of 1913 Liberty Nickels was first suggested in 1919, when Samuel W. Brown placed an advertisement within a numismatic publication offering to buy examples of the coin for $500. It is unknown whether he may have already had the coins in his possession at this point and only placed the advertisement to gain publicity or legitimize the existence of the coins. The following year, Brown would publicly display an example of the 1913 Liberty Nickel. It can reasonably assumed that Brown did not strike the coins himself. He had been employed by the Mint, but only served as a clerk and it is unlikely that he would have had the experience to strike the coins. Brown may have known others within the Mint who either helped him with the coinage or told him about the creation of these coins which never should have existed. Various theories about the exact circumstances have been suggested, but the truth will probably never be known. After the 1913 Liberty Nickels were publicly displayed for the first time in 1920, all five coins passed to various owners. In the early 1940’s, Eric P. Newman would come into possession of all five coins, representing the last time that a person held ownership of all known examples. From this point, the coins once again passed to different owners, including some of the most well known coin collectors and dealers such as B. Max Mehl, King Farouk, and Abe Kossoff. Earlier owners of the coins had also included Stephen K. Nagy, Wayte Raymond and Colonel E.H.R. Green. The most famous example, without doubt, was the one which starred in a 1974 episode of the television series Hawaii Five-O. The specimen featured in the show is considered to be the second finest known example. Rather than using a copy, the directors of the program decided to use this genuine example of the coin when filming selected parts of the episode. The appearance of the 1913 Liberty Nickel within this popular show, created more fame and attention for this enigmatic rarity. There are only five examples of the 1913 Liberty Nickel known to exist. On the infrequent occasion when one of these pieces comes to market, the roster of coins is often repeated with their various pedigrees. Of the five examples, the finest known is the Eliasberg specimen, which is graded PCGS PR66. The remaining coins fall into lower grades, with the ANA specimen grading NGC PF 55 due to a previous owners habit of carrying the coin around for bragging or wagering. The five known examples with their certified or estimated grade levels are shown below. The highest recorded price ever paid for a 1913 Liberty Nickel presumably is $5 million, paid by an anonymous collector for the Eliasberg specimen, without doubt the finest known for this issue. When the same example had been sold at public auction only a few years earlier in 2001, it had realized $1,840,000. Previously, in 1996 the same coin sold for $1,485,000, representing the first coin to ever sell for more than a million dollars at a public auction. Unsurprisingly, the other 1913 Liberty Nickels have also sold for major sums, both in auctions and in private transactions. 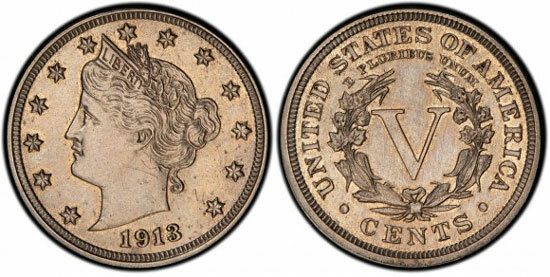 The record price set at public auction for any 1913 Liberty nickel was $3,737,500 in January 2010, when the Olsen specimen sold. Other auction appearances have been infrequent, with only seven occurrences in the last fifty years. After the auctions, these coins were often sold in private transactions and afterwards remained off the market for lengthy periods of time. It is very unlikely to almost impossible that anymore 1913 Liberty Nickels will ever be discovered. While it cannot be considered to be the rarest of all American coins it is certainly one of the most famous, and this serves as a prime example of an issue which will always remain in demand, thanks to its interesting background.